Price: £1.95 (incl VAT) Sorry, this item is currently unavailable. Click here to receive notification when this product comes back into stock. 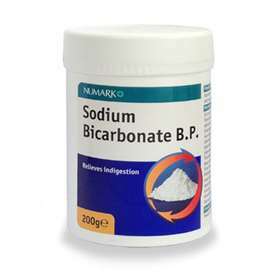 Numark Sodium Bicarbonate is an antacid used for the relief of indigestion. Do not use if you have congestive heart failure, if you are taking any prescribed medicines talk to you doctor before using this product. If you have heart, kidney or liver problems, high blood pressure are pregnant or planning to become pregnant consult your doctor or pharmacist before use. This product contains 1.37g of sodium per 5g dose (which should be taken into consideration if you are on a low salt (sodium) diet). Prolonged use should be avoided as it may cause Alkalosis (too much alkali in body fluids), especially in patients with impaired kidney function. Immediate medical advice should be sought in the event of an overdose. Take 1g-5g dissolved in a glass of warm water. A level 5ml spoon holds about 5g. this dose can be taken every 4 to 6 hours. When dissolved in water use within 30 minutes. May cause stomach cramps and wind, if you notice these or any other side effects stop using and consult your doctor or pharmacist. Active ingredient: Sodium Bicarbonate 100%. Other brands may be sent as a alternative. Product code: 0274480 Price: £1.95 (incl VAT) Sorry, this item is currently unavailable. Click here to receive notification when this product comes back into stock.